The internship is designed to bridge the gulf between the theoretical knowledge and real life experience as a part of Masters of Business Administration (MBA) program. It is designed to have. a practical experience while passing through the theoretical understanding. The report is a combination of three-month internship program with DHAKA BANK Ltd.
As a matter of fact, in Bangladesh, now-a-days more than 50 commercial and specialized banks are conducting their operations, but they differ from one another in many ways regarding their services. Some of the foreign and private banks extend their customer services in a better standard than that of the traditional systems of some of the local banks. (A) General Banking Department, (B) Deposit Department, (C) Loans & Advance Department, (D) Foreign Exchange Department (Import & Export). I acknowledged different banking functions and day-to-day banking operations on my way in completing this internship. In this report I have best explained my real life experience gathered from different departments. The report is divided into 3 sections. 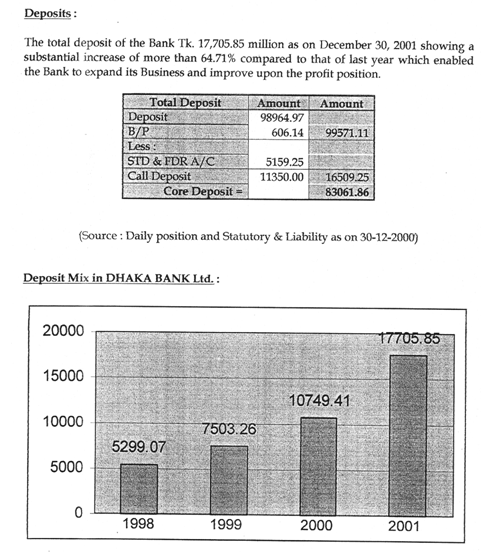 Section – A deals with the organizational overview of DHAKA BANK Ltd. and Foreign Exchange Branch at a glance. 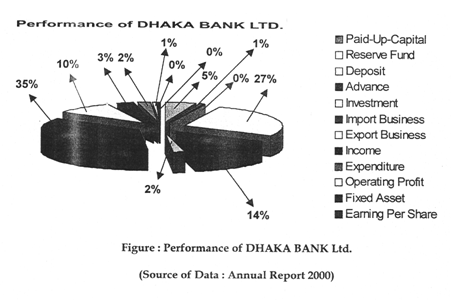 This section is further subdivided into two parts; one is the structural detail of DHAKA BANK Ltd. and the other is the detail of Foreign Exchange Branch. 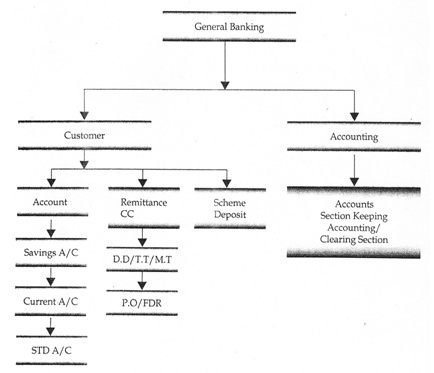 Section – B includes banking operations of different departments of the bank & its procedures. This section is also subdivided into three parts of General Banking, Foreign Exchange and Advance department. Section – C gives the detailed information regarding findings, recommendations and conclusions & employees’ perception that specifies working experience during internship in different departments. The last section is based on overall information compiled from the total report. 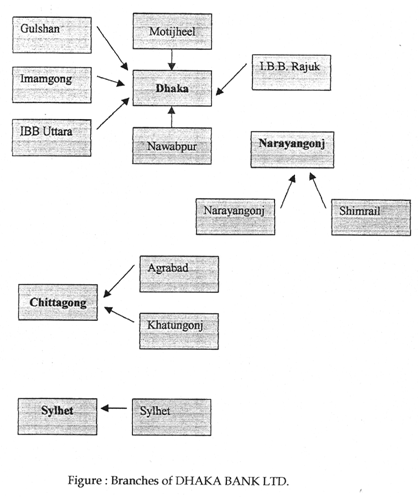 All this chapters explain my workings in DHAKA BANK Ltd. which indicates my effective learning through the internship program. The chapters show the activities and the drawbacks the different departments are facing and also some suggestions regarding the drawbacks by eliminating which, DHAKA BANK Ltd. could open a new horizon in successful banking. 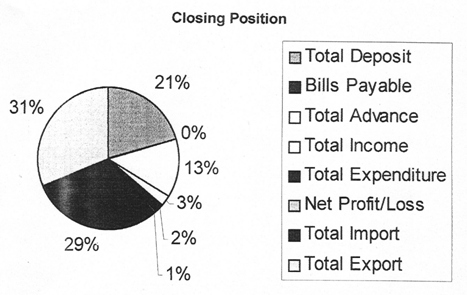 The advance portfolio of the Bank is well diversified and broad based covering various sectors of the economy. Credit facilities were extended to the private sector for trade, project financing as well as to meet the working capital requirements. During the year under review the Bank also extended credit facilities under lease financing as well as syndication arrangements with other Banks and financial institutions. 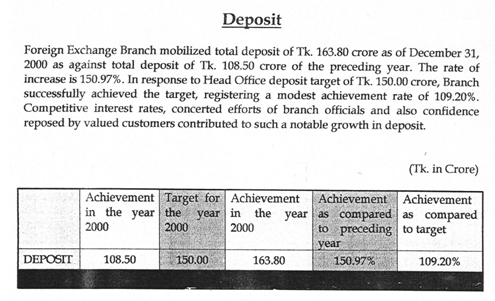 The total loans and advances of the Bank stood at Tk. 3843.40 million as of December 31, 1999. Now on December 31, 2000 the total advances of the Bank are 5414.86 million it is increase of 40.88% of the previous year. 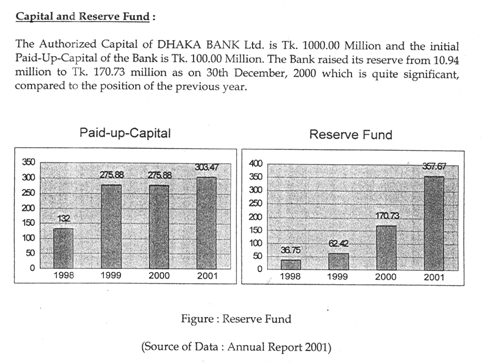 DHAKA BANK Ltd. is one of the third generation local banks in Bangladesh involved in Treasury dealings in local money market. 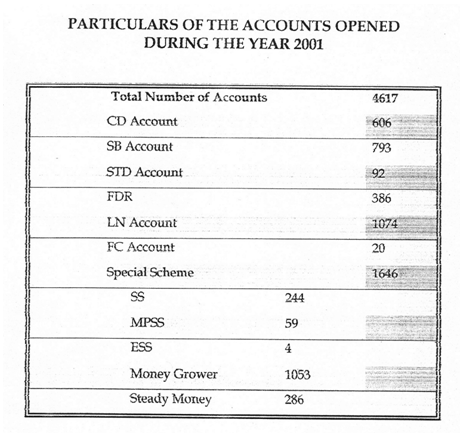 The Bank has handled significant volume of treasury transactions during 2002. Foreign money market dealing room with automated REUTER terminals will be started very soon. From the very beginning the Bank has embarked on extensive Foreign Exchange Business with a view to facilitating international trade transactions of the country. The Bank has established 5535 letters of credit amounting to Tk. 17649.10 million as on December 31, 2001 as against 2603 letters of credit amounting of Tk. 13827.90 million during the preceding year. The growth rate is 27.63% in this sector. The significant items of import were Industrial Raw Materials, Consumer Goods, Machinery, Fabrics and Accessories etc. The Export sector of the country experienced a downturn caused by the worldwide recession during the year 2001. 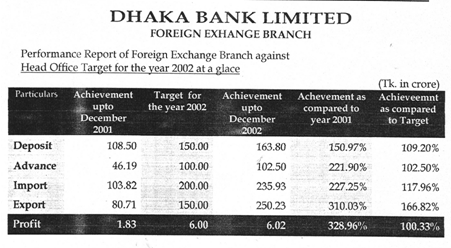 The export business of DHAKA BANK as well had a negative growth of 4.80%. The bank handled an export volume of Tk. 6,182.50 million during the year as compared to Tk. 6,494.00 million in the previous year. 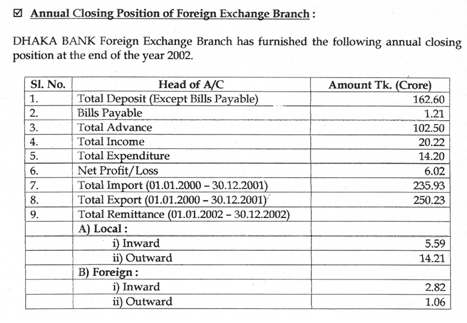 Foreign remittance handled by the Bank stood at Tk. 402.80 million as of December 31, 2001. Countries from which inward foreign remittances were received included USA, UK, Canada, Japan, Taiwan, KSA etc. funds. 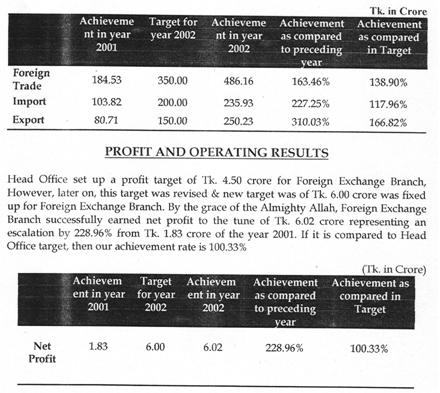 By the 2001 the profit amount is near about Tk. 561.99 million. . The number of Branches as it stands now is 17 (Seventeen) and steps are being taken to open few more Branches at commercially important places by the year 2002 and 3 (Three) more branches are proposed to be launched very soon of which one in Savar and two in the Dhaka City at Mirpur and Dhanmondi. Effective communications is sine qua non for utilization of human resources at its maximum. In this regard Management Committee meetings and frequent meetings of the Executives and Officers were convened at Head Office and Branch level where Business and Management issues .are discussed in a cordial atmosphere. Management by participation has always been of immense value to inspire a sense of belonging and a sense of pride among the employees. In order to maintain high quality of risk assets, utmost efforts are made by the Board of Directors and by the management on an ongoing basis. A management committee sits at the Bank Head Office every Saturday to monitor the quality of loans apart from solving other problems of the Bank. 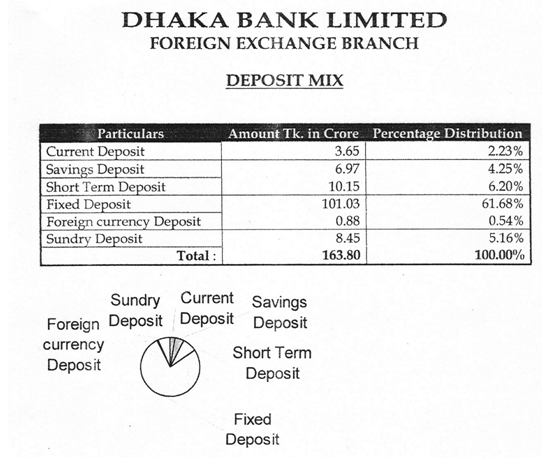 approval of Bangladesh Bank (25% cash dividend and 4.1 % in the form of Bonus Share). As correspondent Banks are the trade partners in handling International Trade, DHAKA BANK Ltd. has established a strong business network across the globe. The Bank has established correspondent relationship with the major Banks. At present the Bank has more than 175 Correspondents. The Bank is well equipped to handle International Trade at each comer of the world. DHAKA BANK endeavors to increase its banking relationship further with prime international Banks in order to cater to the global needs of its customers. DHAKA BANK Ltd. adopted automation in banking operation from the first day of its operation. Basic Accounting Systems of the Bank Branches has been automated to optimize benefits ~d increase overall efficiency for superior customer services by way of increased speed, accuracy and ensured security. The Bank has continuously looked for more and more sophistication and efficiency. With this end in view, the Bank has established Information Technology (IT) Department as a top priority area. There is no alternative to skilled and trained manpower in the service Industry. Bearing this in mind the well educated, promising and honest workers are being appointed and trained. Bank has given top priority for developing skilled manpower and introducing them to modern technologies with the purpose to develop quality customer services. We have recruited experienced Bankers as well as fresh university graduates and postgraduates. The fresh recruits are being trained through BIBM and other Training Institutes. The compositions of Bank’s sources of funds are Paid-Dp-Capital, Reserves, Customer Deposits and Call Loans from different Banks. The Bank used the major portion of this fund for Investment in Loans and Advances. The Bank also invested in Securities and Shares. 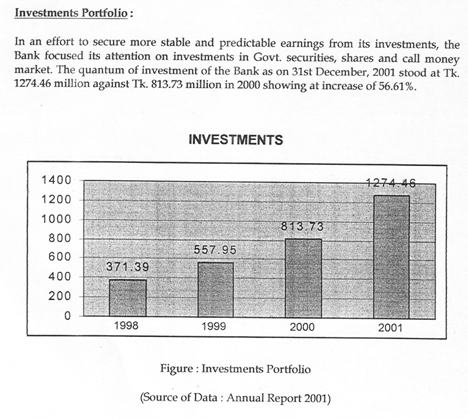 The surplus fund was prudently utilized in Call Money Market to earn satisfactory returns. The Bank has already introduced a number of financial products and services such as Monthly Savings Scheme- Money Grower; Monthly Income Scheme- Steady Money; Super Savings Scheme; Multiples Savings Scheme; Smart Saver Scheme; Education Savings Scheme; Lease Finance. In addition, schemes like Consumer Credit, Credit card, A TM, On Line Banking and other lucrative schemes will be introduced soon. The Board of Directors held 12 meetings during the year and 22 Executive Committee meetings of the Board were held during the same period. In terms of Article 149 of the Articles of Association of the Bank MIS. Howladar, Yunus & Co. Chartered Accountants were appointed as external auditors for conducting the audit of accounts as of 31st December, 2000. The Auditor Howladar Yunus & Co. Chartered Accountants being eligible, offered themselves for re-appointment for the year 2001. Bank’s drive towards market leadership as well as quality in choosing business will continue during the year 2001, although competition has intensified with the opening of more financial institutions. The Bank is optimistic that the volume of business will increase in the coming years through pragmatic and market friendly policies. The Bank shall “co1;ltinue to explore new fields of investment and take steps to open new Branches for banking and capital market related activities. We shall endeavor to adopt customer oriented policies and introduce new techniques that will help to earn profit and increase greater confidence of the existing/ prospective customers. The primary objective of Foreign Exchange Branch is to mobilize the traditional business to grow at an accelerated rate and maintain the growth of the special business such as import and export trades. 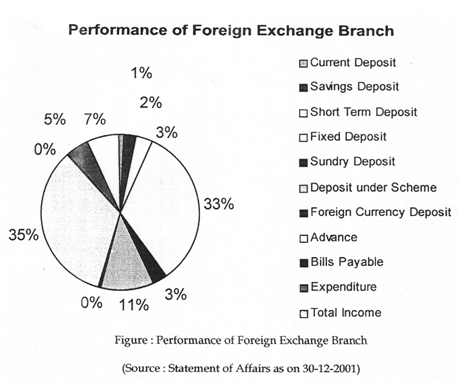 Foreign Exchange Branch was opened on the 10th of April, 1999 and obtained Authorized Dealer (AD) license with effect from 10th April, 1999. 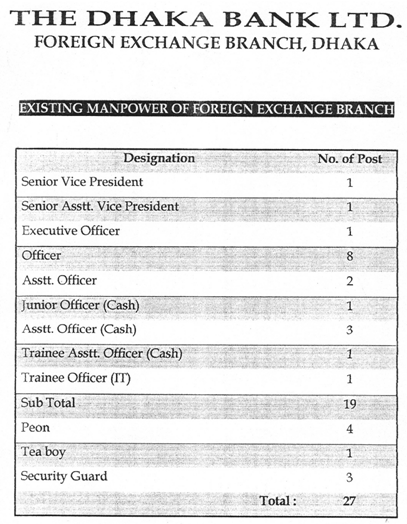 After obtaining the license Foreign Exchange Branch has started its Foreign Exchange business. In pursuance of our Bank’s avowed policy of assisting the development of trade, commerce and industry in the country, Foreign Exchange Branch, since its commencement, has been taking care of the need of the commercial and industrial institutions in the forms of foreign trade finance, working capital and project loan. The involvement of Foreign Exchange Branch in the foreign trade business, though selective in nature, has been gradually increasing in volume over the years. The performance in this nature has been gradually increasing in volume over the years. The performance in this sector during the year under review was quite significant. 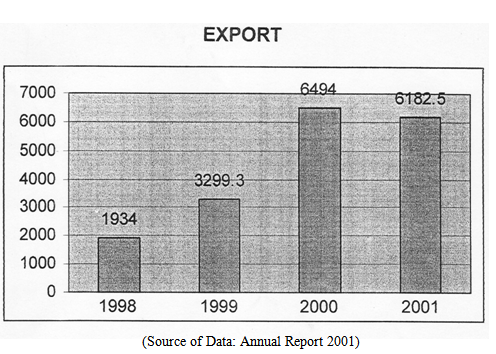 In the year 2002 total volume of foreign trade handled amounted to Tk. 486.16 crore which has been increased by Tk. 301.63 crore from Tk. 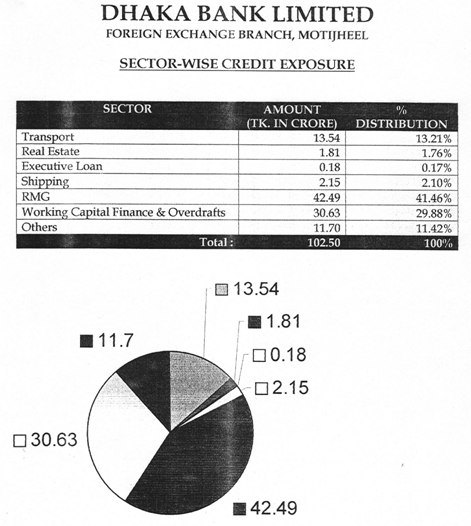 184.53 crore depicting a growth of 163.46% out of total amount of foreign trade business. Imports constituted Tk. 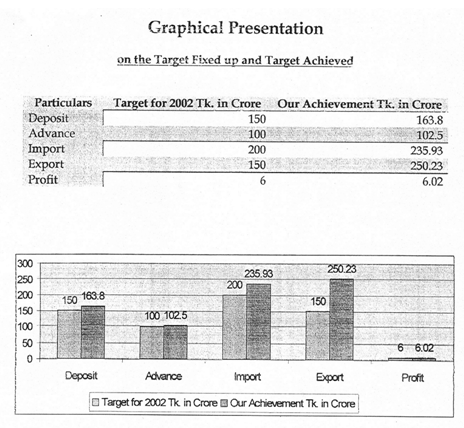 135.93 crore generated from 2231 letters of credit established during the year 2002. 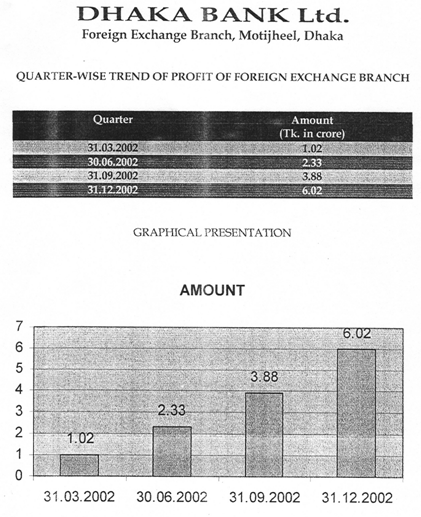 The encouragement of Foreign Exchange Branch to export business sustained an upward trend. 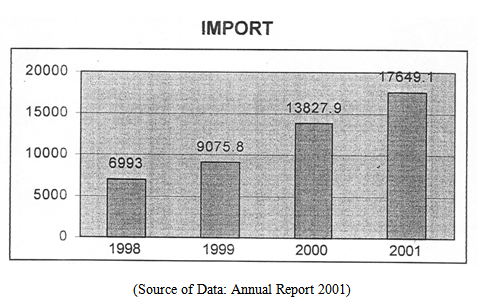 Total export trade during the year 2002 increased by Tk. 169.52 crore from Tk. 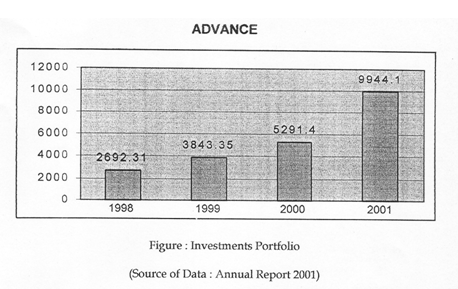 80.71 crore of the year 2001 registering a growth of 210.03%. General13anking is designed to provide financial service to the general people in saving their money, smoothening transactions for businesspersons and ensuring security of the precious wealth of the clientele. Under general banking, DHAKA BANK provides/ offers various kinds of accounts; however, it has to be kept in mind that these accounts and schemes are considered to be the products of the bank And another important fact that still remains is that the general banking sector includes the customer service department, which is another core area of the bank as only a good customer service department can actually tackle the problems of clients that are frequently faced as well as guiding people in opening accounts and, keeping records. All documents getting in and out of the bank have to be recorded for bank purposes and that is yet another function the customer service area is, being a part of the general banking sector. III. Fixed Deposit Accounts. IV. 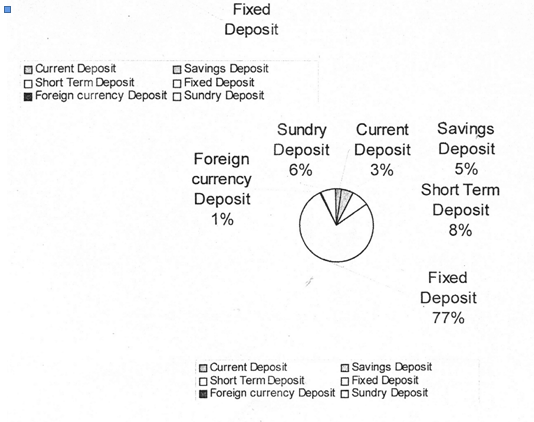 Short Term Deposit A/e. 1. He/She is to fill up a form of the account. 2. He/She is to give one photograph and a photograph of the nominee. 3. He/She has to have a recommendation of that bank. List of Directors as per requirement of Joint Stock Company with signature, Resolution for opening account with bank. Association/ Club / Charity /Trust/ Society etc. Pay Order is one kind of unconditional promissory note or instrument that is issued by the Bank to the customer. The difference between Cheque and pay order is the mode of encashment. Demand Drafts are made for the transfer of money from one place to another in the form of cheque through a particular Bank, which can be en-cashed right way. The Bank issues DD for their outer district branches. When a certain amount of money is asked by the client to transfer from one branch to another then it is called telegraph/ telephone transfer. For IT, there is a particular form. When the form is filled up properly and the customer deposits the amount in the bank, the authorized officer issues a cash memo to the applicant for confirmation. When the customer requires a cheque book, he is to fill up the requisition slip submitting the previous cheque requisition slip. For saving accounts, a 10 page Cheque book is issued and for CD/SOD/CC accounts, 25 and 50 page checkbooks are issued according to the requirement of the customer. When the customer needs a 50 page Cheque book it is necessary to submit an application but in DHAKA BANK now a 50 page Cheque book is not applicable and in that case two 25 page cheque books are issued to the customer according to the permission from the concerned officer. In the clearing section, the work is to clear the cheque and PO through Bangladesh Bank that are submitted for cash collection. Everyday clearinghouse takes place in Bangladesh Bank, once in the morning called morning house, another in the evening called return house. In the house all the Banks’ representative sit together and exchange their money receive instrument of the particular banks to clear the paper and transfer the money to their particular accounts. The above Cheque or instruments of DHAKA BANK that are submitted to other banks for collections are, called in-ward clearing. The cheque of other banks that are submitted to DHAKA BANK for collection are called Out-ward clearing. 2. Cheque issuing register like CD, 5B, 51’0. 4. mCA & issuing and receiving register. 5. Pay order, DO & IT, issuing and payment register. 8. 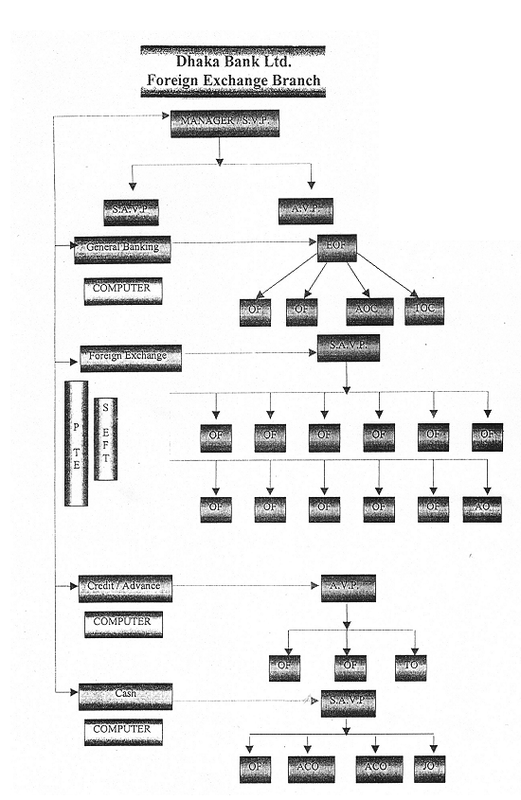 LBC & OBC register. To encourage people to save for self and for the country as a whole. To develop a sustained savings habit among the people. Savings help to build up capital and capital is the prime source of business investments in the country. Investment takes the country towards industrialization which eventually creates wealth. That is why savings are treated as the very foundation of development. To create more awareness and motivate people to save, DHAKA BANK offers “Multiplus Savings Scheme”. Any individual company, educational institution, government organization, NGO, trust societies etc. may invest their savings under this scheme. The deposit can be made in multiples of Tk. 10,000. The period of deposit is 10 years. But the deposit can be withdrawn any year with interest. As an example, if deposit is withdrawn after completion of 1 year but before 2 years, deposit with interest will be paid for the prescribed rate for 1 year. 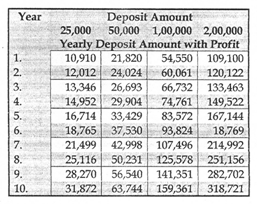 If deposit is withdrawn before 1 year, then no interest will be paid. Any customer can open more than one account in a branch in his/her name or in joint names. A deposit receipt will be issued at the time opening of the account. A depositor can avail loan up to 80% of the deposit under this scheme. In case of issuing duplicate receipt, the rules of issuing a duplicate receipt of Term Deposit will be applicable. In case of death of the depositor, before the term, the deposit (with interest at savings rate) will be given to the nominee. In the absence of the nominee, the heirs/successors will be paid on production of succession certificate. The nominee may, at his/her option, continue the scheme for the full term. The most gratifying experience for parents are proper education for their children. Educational expenses are rapidly increasing and therefore, appropriate planning needs to be done by all parents. DHAKA BANK offers you “Education Savings Scheme” to assist in financial planning well ahead in time for children’s higher education. The instrument shall be issued for 7 year, 10 year, 15 year or 20 year term. completion of the respective term. receipt or Instrument with the Bank duly discharged by him with the written instruction to pay the amount to his/her nominated person on monthly installment basis as stipulated in the Scheme. 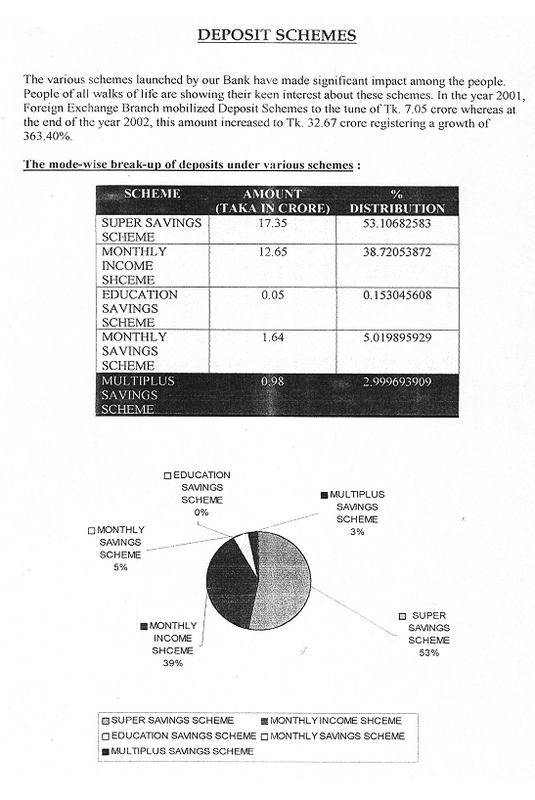 and paid as per prevailing savings rate. b) If withdrawal is made at any time after seven years, the total amount payable at maturity of the immediate preceding term will be paid along with interest for the fractional period at prevailing savings rate. a) In case of death of the depositor, the proceeds will be paid to the nominee of the depositor or in absence of nomination, to the legal successor/s of the depositor on production of Succession Certificate. 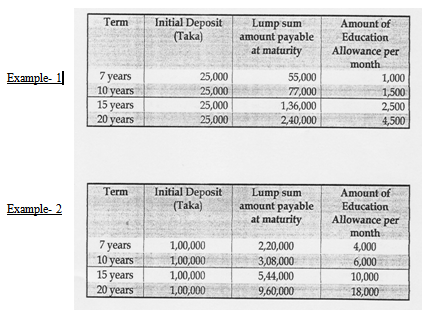 b) If, after death of the depositor, the nominee intends to continue the deposit to get monthly educational allowance for 6 years as admissible under the rules of the scheme, the receipt of the deposit should be surrendered to the Bank duly discharged by the nominee and duly authenticated by the legal guardian on maturity. Profitable Investment Opportunity attracts people’s saving tendency. For this DHAKA BANK offers ‘Double Benefit Scheme’ that makes a deposit double in 6 years. 1. Tk. 10,000 and its any multiple may be received as deposit. 2. The deposit is taken only for six years. deposit. This receipt is non-transferable. is withdrawn within one year. this case interest@ 16% will be charged against the loan. 6. In case of death of the depositor, before the term, the deposited money (with interest at savings rate) will be given to the nominee. In absence of the nominee, the legal successors of the depositor (on the basis of succession certificate) will be given the same. In case of issuing a duplicate deposit receipt, the rules of issuing a duplicate receipt of Term Deposit will be applicable. A monthly savings scheme secures your future with ease. A small savings today will provide you comfort tomorrow.